When I think back to the beginning of this film project, I remember feeling only gratitude and trust. During the whole of the filming, the project was supported voluntarily by people who just wanted to see the project succeed, because they understood the value and the potential of the film for humankind. So the "universe" co-created this film by supporting me with a lot of amazing "coincidences". The trust that I felt when setting out to make ‘A New We’ has grown even greater now. 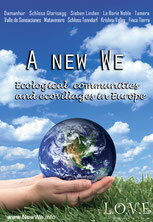 The aim of "A New We" was to show that it is possible to live a happy, peaceful and sustainable life in community. My intention was to arouse this awareness in people, and then motivate them to dive even deeper into the possibility. We have received amazing feedback about the life-changing effect of the film. Many viewers feel hope and inspiration, and are motivated to explore the possibilities of moving into this heart-centered way of being. Others determine to act on the realization of their own longstanding dreams of either living in community or creating their own unique community. It makes me very happy to know that we are succeeding. For this I feel deep gratitude. Even though the communities shown in the film do not conform in all aspects with my own personal highest vision of living, they collectively show the possibility of creating a brighter future on this planet. I purposely selected a variety of communal sizes, visions, economic systems and governing philosophies, and what is shown has hardly scratched the surface of what is out there. In this time, it’s no longer rational or reasonable to reject the concept of living in community by calling it Utopian Thinking ... everyone who has seen the film is witness to the reality that conscious, peaceful living can exist when people respect each other and the Earth. Utopia is manifesting now, in thousands of eco-villages and intentional communities worldwide. And that is changing the world! Even though Mother Earth has to go through a lot of trouble right now, I see more light and hope than I have ever seen before. I see a truly bright future in cooperation, love and respect between ALL beings! I know that many people share my vision, and my greatest hope is that this film can contribute to its realization. So let’s spread the word and create heaven on earth - A New We - for all people, all animals, all plants, and all beings who are still to come!